Strong, fast, precise, consistent stitch length even on the thickest parts! Here is the 2261HP, a reverse-arm lap felling unit with 3 needle chain stitch for double lap sewing on jeans, casual trousers, work clothes and denim clothes in general. 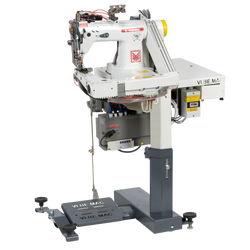 This machine is particularly suitable to stitch back yoke and back rise parts, inseam in and out seams and top stitch operations. This unit does not have rivals even when it is used for shirts. -A special belt puller guarantees a very fast feeding and perfect matching between the parts. After sewing, the puller device guides the sewn parts to the chain cutter device and, finally, to unloading. The 2261HP works at 4999 rpm, thanks to its outstanding features, as follows: feeding lubrication, design and construction quality, puller device and a special sensor for the dynamic presser foot control (DCP system). The above mentioned DCP system avoids the skipped stitches even on the thickest seat parts, which is the most critical point for every feed off the arm machine existing on the market. Other important features are a hovering chain cutter that guarantees a clean working environment and the one-leg adjustable stand which can be regulated to the preferred height. -Higher Productivity: the unit's speed (4999 rpm) thanks to the smart puller system ensures the incomparable levels of productivity in the market - up to 5 inseams per minute!